The physical shapes of the crocodile and alligator is proof enough that these creatures have existed here on Earth for millions of years. In fact, if I’m not mistaken, it’s already about two hundred million years since these creatures first appeared on our beautiful planet. That is an amazing accomplishment as other creatures would have already become extinct if not endangered at this point in time. Now even though it’s been such a long time, it is amazing that a lot of people, including myself, are not really sure if there is a difference between the crocodile and alligator. In fact at one point, I thought they were the same thing. Let’s study them a bit closer so we may come to realize what the differences are. In terms of menacing looks, have you ever seen those gators that look like they are made of stone? If that somehow rings a bell, then you've probably seen an alligator. If it looks a bit more alive, then it was more likely a crocodile. It’s a blunt way to start but I really had to mention it as that is one of the easier “no brainer” ways to determine which is which. Whichever species you find yourself facing, crocodiles and alligators are both fierce predators that endanger we humans when we are in their environment because of their slick body shape and amazing bone crushing strength. Now those are the common traits these two killers share, but what makes them distinct aside from the looking more alive point of view? Let’s start with the alligators. These guys fall under a family called the alligatoridae which are members of a species, namely the American and the Chinese Alligator. On an average, an adult version of these reptiles weigh a crushing eight hundred pounds and are a whooping thirteen feet in length however they do have the capacity to weigh about a thousand pounds and can grow up to fourteen and a half feet. 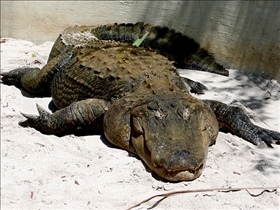 The crocodile’s weight and height however vary among its species. They can be as small as a meter in length to around twenty feet. The major aspect about these crocodiles is the pressure on their bite. These reptiles are said to have the most powerful animal bite with a force above five thousand pounds! That my friend is equivalent to excruciating pain, if the bitten part is still attached. If you’re trying to identify whether the reptile in front of you is an alligator or a crocodile, the head would be good place to focus some attention. Alligator heads are wider and shorter compared to that of crocodiles. The gators snout is more of a U-shape and the crocs have a V-shape snout. It is also proven that alligators are less aggressive in nature compared to his crocodile cousins. 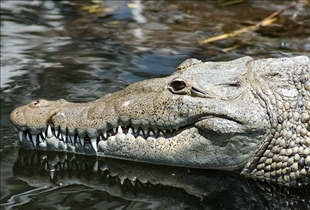 Alligators and Crocodiles have been around for millions of years and the shape of their bodies are testament to that. Alligators are darker in color hence they inherit a statue look whereas crocodiles are lighter in color and appear to be more lively. The crocodiles boast the fiercest animal bite in the planet by applying a force of more than five thousand pounds in a single bite. Alligator heads are wider and shorter when compared to that of crocodiles. "and are a whooping thirteen feet in height"
Thirteen feet in HEIGHT!!! I guess you meant length. Thanks Aussie, we corrected it. The statesman scene most these crocodiles is the pressure on their feeding. These reptiles are said to know the most ruling animal meal with a validity above squad yard pounds! That my quaker is equal to excruciating discompose, if the bitten component is relieve loving.